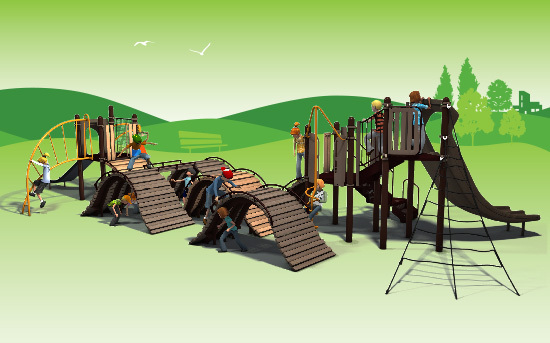 We are excited to showcase one of our newest playground designs—the Hillscape Adventure! The treaded boardwalk-like climber mimics a hillside landscape and fits naturally into surrounding environments. This design can be ordered as is, customized to fit your site or budget needs, or use it as a starting point and create a design that’s completely unique. The Hillscape Adventure offers a never-before-seen shape in playground design. Its wavy form and wood-grain textured boards are eye-catching to park visitors, and delivers a truly innovative play experience for kids ages 5 to 12. In addition to providing a unique climbing challenge, kids’ tactile, visual, proprioceptive and vestibular senses are engaged as they play. Even more, the Hillscape Adventure encourages imaginative, unscripted play. This flowing climber is available as a component within a playground structure or can be installed as a freestanding playground climber to accommodate a variety of space and budget requirements. Learn more about the Hillscape Adventure and all of our design capabilities, then contact your local playground consultant to get started on your next playground design. This entry was posted in Custom, Design, Inclusive Play, Nature-Inspired, Play Environment, playgrounds, Sensory play and tagged Playground climber, sensory-rich activities, unscripted play by PlayLSI. Bookmark the permalink.